Accidents involving large trucks, semi-trucks, tractor trailers, or commercial motor vehicles (CMVs) are rarely minor because of the size and strength of these vehicles. In 2014, 3,903 people died in crashes involving large trucks, and an estimated 111,000 people were injured; nearly 75 percent of truck-related fatalities were occupants of passenger vehicles. The Little Rock injury attorneys at the Minton Law Firm provide aggressive representation for truck accident victims. Arkansas is among 14 states that suffer an unusually high rate of truck accidents. For example, in 2014, of 668 traffic fatalities 75 involved a large truck, or 11.2 percent of total vehicle fatalities in Arkansas. If you or a loved one is injured by a large truck or commercial motor vehicle, the Little Rock truck accident attorneys at the Minton Law Firm are here to help. Call 501-404-5433 for a free consultation today. Why Are Truck Accidents Different? Large trucks and commercial motor vehicles (CMV) are used by businesses to transport goods or fare-paying passengers throughout the U.S.
Large trucks, while called different names (18-wheelers, tractor trailers, tankers, delivery trucks, semis, freight trucks, and buses), are generally those with a gross vehicle weight rating (GVWR) greater than 10,000 pounds. Because of their size and uses, large trucks and CMVs have features that make them particularly dangerous on the roads and in accidents. For example, large trucks require longer stopping distances; they may carry cargo that affects the maneuverability of the truck; and large trucks use air brakes (not hydraulic), which can be extremely dangerous if not properly maintained. Multiple responsible parties: In the event of a large truck accident, several parties could potentially be held responsible, including the driver, employer, or truck manufacturer. Federal trucking regulations: Truck drivers often drive long distances under tight deadlines and may push through fatigue to get the job done. Federal regulations have been established to prevent truck drivers from driving under such conditions. Drug and alcohol abuse: Truck drivers that drink alcohol before driving or use drugs to stay alert put themselves and others at great risk. Hazardous materials: Sometimes the contents of what’s being transported plays into how and why an accident occurs. Some trucks carry hazardous liquid that can exacerbate the severity of a large truck accident. Commercial driver’s license regulations: It is illegal to drive a CMV without a current and valid commercial driver’s license. These are just a few reasons why large truck accidents are distinct from other accidents. These reasons are also why it’s important for truck accident victims to seek counsel from a knowledgeable truck accident attorney. The truck accident lawyers at Minton Law Firm understand the critical factors that inform a truck accident or CMV case. If you or a loved one has suffered a truck-related injury, we want to hear your story. Call 501-404-5433 for a free consultation, or tell us what happened online to get started today. Truck accidents are complicated and often catastrophic. Unfortunately, a defendant driver’s insurance coverage may not be enough to cover the injuries sustained from such a significant crash. The truck accident lawyers at Minton Law Firm have invaluable insurance experience. A former insurance adjuster, Justin Minton understands the strength and strategy of insurance companies and will work tirelessly to exhaust all available sources of insurance coverage. Who Is Responsible for a Large Truck Accident in Arkansas? Under Arkansas statute, courts exercise a rule known as modified comparative fault, or modified comparative negligence. Modified comparative fault looks at all parties and the unique circumstances of an accident to determine who, and to what degree, is responsible for an accident. It’s possible for more than one person or entity to be found liable in a large truck accident. In Arkansas, liability cases of personal injury, wrongful death, or property damage are determined by comparing each party’s contribution to the accident. If an injured person is found less than 50 percent at fault for the accident then damages can be compensated. If an injured party is found to be partially responsible, liability is assigned as a percentage, and compensation is awarded based on those percentages. However, if an injured party is found more than 50 percent responsible, he or she may not recover damages; this is known as contributory negligence. Arkansas uses a mix of contributory and comparative negligence to determine who is eligible to receive damages and how much compensation can be awarded. If you’re in an accident with a large truck or CMV and not seriously injured, call the police for assistance. In addition to securing the scene of the accident, the police will fill out an official police report that documents the accident. You will need this report if you decide to file a claim. DO NOT discuss the accident or your injuries with the other driver or the other driver’s insurance company. Instead, schedule a free consultation with a truck accident attorney at Minton Law Firm. 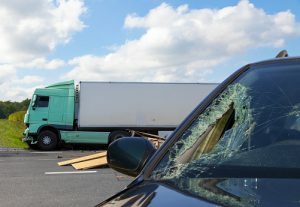 If you or a loved one is injured by a large truck or commercial vehicle, the truck accident attorneys at the Minton Law Firm want to hear from you. Call 501-404-5433 for a free consultation today.